Sir Bobby and Lady Elsie started their European Travels in Holland where Bobby first managed PSV Eindhoven winning back to back Dutch League Championships in 1991 and 1992. Bobby then moved to Sporting Lisbon where he teamed up with Jose Mourinho who was appointed as his interpreter – the rest is history. After a period at Sporting, FC Porto snapped Bobby up (Jose went with him) where he went on to do the triple, winning the Portuguese Winners Cup in 1994, plus Porto were Portuguese League Champions in 1995 and 1996. This success was followed by a move to Barcelona where in 1997 it was Bobby’s bonanza year – winning the Spanish Cup , the Super Group & runners up in La Liga and to top it all off the European Cup Winners Cup. Throughout those years Bobby and Elsie enjoyed living in continental Europe and were particularly fond of their time in Portugal. When the opportunity arose for Bobby to become involved again in Portugal at Vila Sol on the Algarve, one of the ideas was to run a golf day in Bobby’s name to the benefit of a charity. Back in 2003 Bobby and Lady Elsie chose the Refugio Aboim Ascensão to be the benefactors of the funds raised at the tournament. The home looks after 95 children at any one time and is a 7-days a week, 24 hours a day operation. Its Director, Dr. Luis Villas-Boas and his dedicated team, look after the children and create a home and new lives for them. The philosophy the Director and staff of the Refugio live by is that “Every child has the right to be loved“. 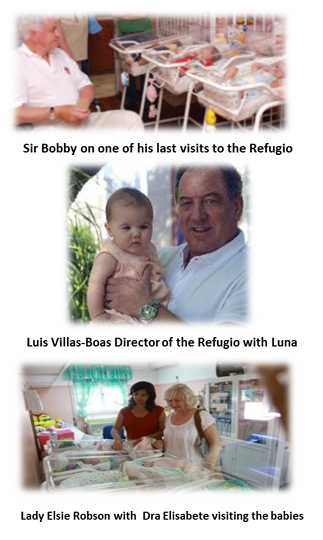 Since Sir Bobby started this tournament in 2004 – 1.1 million Euros has been raised for the children and the tournament is now a major fund raiser for the Refugio. Cheque Payments send to: Refugio Aboim Ascensão, Sir Bobby Robson Donation, Rua Manuel Ascensão 9, 8000-389, Faro, Portugal.